When the field gets big, the primaries get weird. Minnesota Sen. Amy Klobuchar became the 10th major Democratic candidate for president on Sunday. She almost certainly won’t be the last addition to the field. Another 20 or so prominent Democrats are still considering a presidential bid, which could eventually send the number of candidates into the teens or even 20s — perhaps eclipsing the 17 major candidates who ran for the Republican nomination in 2016. But is the number of candidates really a meaningful metric? Sometimes the field can winnow dramatically in the run-up to the first primaries and caucuses or shortly thereafter. By my count, 12 major candidates sought the Republican nomination in 2000. But many of them dropped out before anyone voted, and after New Hampshire it was really just a two-way race between then-Texas Gov. George W. Bush and Sen. John McCain. And in 2004, then-Sen. John Kerry emerged from a crowded Democratic field to win the nomination fairly easily after strong showings in the early states. Those cases are more the exception than the rule, however. In fact, the size of the field usually does tell us a lot about how the primary will play out. In particular, it tells us whether party elites are likely to form a consensus around a single candidate, as the Democratic establishment did around Hillary Clinton in 2016 but as Republicans famously failed to do in that year’s primary process, paving the way for the nomination of President Trump. The crowded field developing for 2020 doesn’t necessarily imply that an anti-establishment candidate will prevail. Even when party elites don’t get their first choice, they usually get someone they can live with. But the high number of candidates does imply a higher-than-usual risk of chaos. It also implies that the “next-in-line” candidates, former Vice President Joe Biden and Sen. Bernie Sanders, aren’t intimidating anyone. Neither Biden nor Sanders have officially entered the race yet, and it’s possible they’ll unveil a slew of endorsements when (and if) they do, which would show that the party backed them all along. But that seems unlikely. If they had strong support from party elites, we probably wouldn’t have so many other candidates already running or actively contemplating a bid — especially candidates who appeal to the same kinds of voters as Sanders and Biden do.1 That inference also aligns with reporting about Biden and Sanders that suggests they’re having trouble finding the support from party actors they were hoping for. Let’s take a step back, though. How to define the number of “major” candidates running for president is a little tricky. Technically, there are already hundreds of people who have filed their paperwork to run for president in 2020, but most of them are people you’ve never heard of and never will. In a perfect world, you might evaluate a series of criteria to determine who’s a major candidate, including whether they’re regularly included in media coverage about the campaign, whether they’re included in polls, whether they’ve raise a significant amount of money, whether they’re invited to participate in the debates, whether they have traditional credentials for the presidency, whether they have ballot access in most states, and so forth. It’s probably worth erring on the side of inclusiveness, but you can go overboard and wind up with a list that’s dozens or hundreds of candidates long. For purposes of this article, though, I’m mostly using press coverage and credentials as the markers of major candidates. If the media is ambivalent about whether someone qualifies as a major candidate, I tend to give them the benefit of the doubt if they’ve held elected office before, but otherwise not. Mayor Pete Buttigieg of South Bend, Indiana. Former San Antonio mayor and former Housing and Urban Development Secretary Julian Castro. Former U.S. Rep. John Delaney of Maryland. U.S. Rep. Tulsi Gabbard of Hawaii. Sen. Kirsten Gillibrand of New York. Sen. Kamala Harris of California. 10. Former state senator Richard Ojeda of West Virginia (withdrawn). Given at least a 10 percent chance of running at PredictIt. Or is included on The New York Times’s list of potential candidates. Which other Democrats might run for president? * As of 5:15 p.m. on Feb. 12, 2019. For Inslee, O’Rourke, Bloomberg and Landrieu, PredictIt asks bettors whether a potential candidate will enter the race by a certain date, rather than whether they’ll run at all. These probabilities imply that an additional 10 or 11 Democrats will enter the race, although there’s still a fairly wide range of possibilities. If you assume (possibly dubiously) that each candidate’s decision is independent, the 95 percent confidence interval runs from seven additional candidates to 14. That means that we’ll end up with a total of between 17 and 24 Democratic candidates, including the 10 (one since withdrawn) we have already. So while a handful of candidates have declined a bid — Los Angeles Mayor Eric Garcetti and former Massachusetts Gov. Deval Patrick probably foremost among them — this is likely to be a very big, possibly even record-breaking field. How many ‘major’ candidates ran in previous primaries? “Major” is a somewhat squishy term, and although this list errs on the side of inclusivity, a few candidates may have slipped through the cracks. The table includes candidates who withdrew before competing in any primaries. I have the 17-candidate Republican field of 2016 as the largest since at least 1972, although the 1972 (15 candidates) and 1976 (16 candidates) Democratic primaries are close. You can also see how the number of candidates has tended to rise and fall over time. After the chaotic 1972 and 1976 nomination cycles, parties averaged 8.6 candidates per cycle between 1980 and 2000. The average has been 11 per election since 2004, however, and it will likely rise to 12 or 13 depending on how many more candidates we get this year. As should be pretty intuitive, larger fields are correlated with more prolonged nomination processes in which both voters and party elites have a harder time reaching consensus. Below is a table comparing the number of candidates in each past cycle against the share of the overall popular vote the nominee eventually received. I’ve also included a more subjective measure of whether party elites were able to get their way. I consider the party to have decided — that is, for party elites to have gotten their preferred choice — if there was a clear front-runner in endorsements in advance of the Iowa caucuses and that candidate won the nomination. And I consider the elites to have failed if a factional candidate who lacked broad support from the party establishment won. Then there are in-between cases such as the 2008 Democratic primary, in which party elites didn’t necessarily get their first choice (or there wasn’t a clear first choice), but the candidate who emerged was broadly acceptable to multiple major factions of the party. Did party elites get what they wanted? * Excluding nomination processes for which an incumbent president was running for that party. This table ought to worry establishment Democrats. The three past elections when the field was as large as its shaping up to be in 2020 all resulted in party elites failing to get their way. They also resulted in a nominee who failed to get 50 percent of the popular vote in the primaries, which could yield a contested convention since Democratic delegate allocation rules are highly proportional to the popular vote. In a field of 20 candidates, for instance, you’d project — extrapolating from the data above — that the eventual nominee would have either 32 percent or 40 percent of the popular vote, depending on whether you use a linear or logarithmic trendline. That could mean that the race is decided at the convention. Granted, extrapolation can be dangerous in cases like these. If we do wind up with a field of 20 or so Democratic candidates, we’ll be in outlier-land because we’ve never had a field so large before. 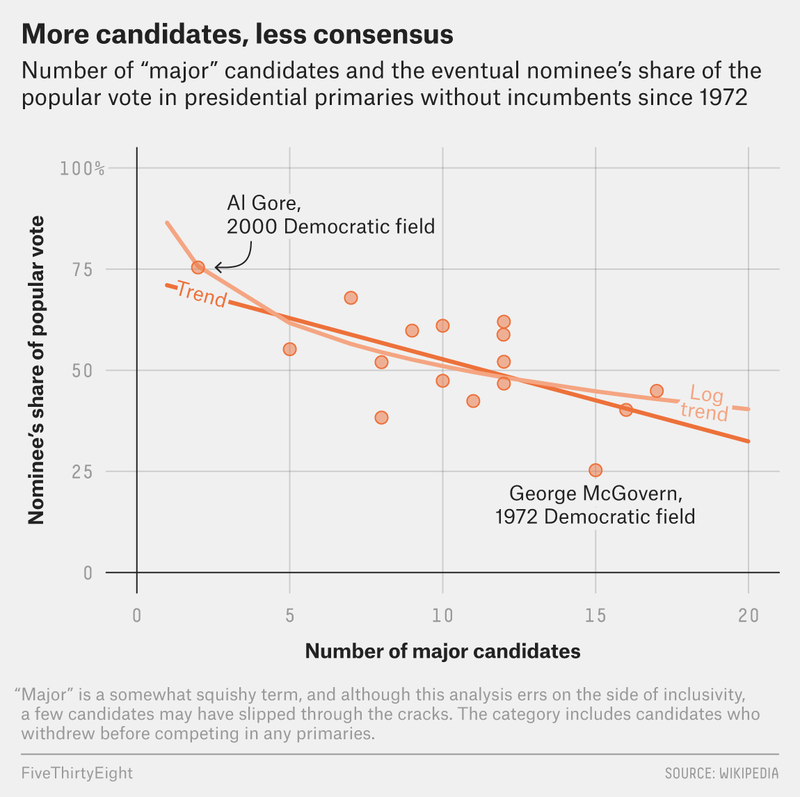 But the past electoral cycles where the field was nearly as big as this one shouldn’t exactly be comforting to Democrats, and it should be particularly worrying for next-in-line candidates such as Biden. Democratic voters like a lot of their choices and feel optimistic about their chances of beating Trump in 2020. The large field is both a sign that there may not be consensus about the best candidate and a source of unpredictability. Such as Klobuchar for Biden or Sen. Elizabeth Warren for Sanders. Including formulating an exploratory committee. For candidates who don’t have PredictIt prices, I treat a New York Times categorization that they’re “likely to run” as equivalent to a 75 percent chance of running, “might run” as 50 percent, and “unlikely to run” as 25 percent. For candidates who neither have New York Times categories nor PredictIt prices, I’m just using my own subjective estimate of their likelihood of running.